The IAM and its members have always taken the time to find ways to give to those in need. This holiday season, across North America, that spirit is on display in a variety of ways. 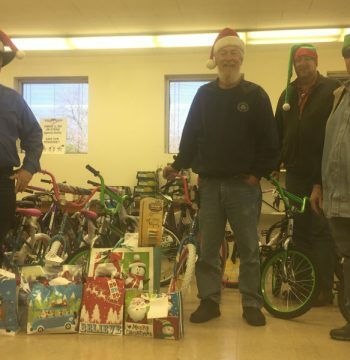 IAM Local 1280 in Newark, OH, along with the Electrical Workers (IBEW) and the Glass, Molders, Pottery, Plastics and Allied Workers (GMP), bought and assembled 125 bikes and helmets for the Salvation Army’s “Bikes for Kids” drive. 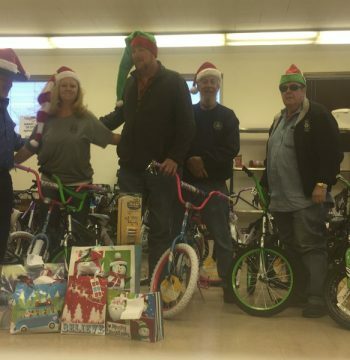 The 12-year tradition is carried on in the memory of deceased IAM member Dave “Stinky” Pugh, who along with his wife would donate several bicycles each holiday season to the program. 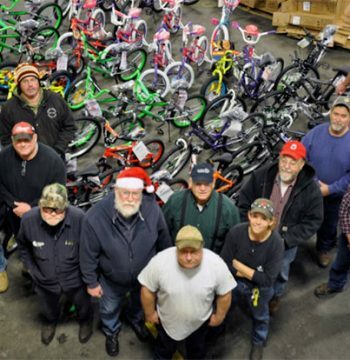 The members, employed at fiberglass-manufacturer Owens Corning, raised money for the bikes through employee donations, contributions from other unions, local businesses and other organizations. Management has joined in by raffling off a vacation day, which has become a popular tradition in the effort. Over the years, the Newark team has assembled, and donated more than 1,000 bikes to the program. Bath, ME Machinists Local S6 held their annual U.S. Marines Corp Toys for Tots campaign. The local’s community services committee put out boxes in the Bath Iron Works Shipyard facilities for the week long toy collection, ending with a monetary collection day. 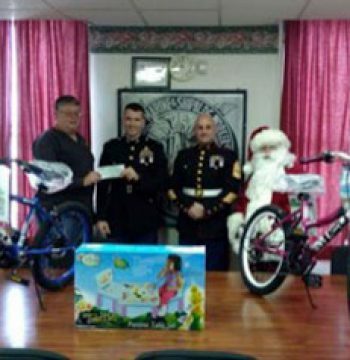 The local presented a check to the Marines for $16,047 and a truck full of toys and bikes to be distributed throughout Maine for kids who are less fortunate. 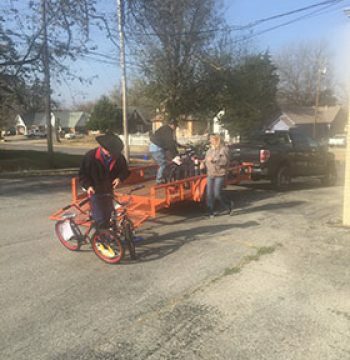 Dallas/Fort Worth-area IAM Locals 776A, B, C and District 776 collected bikes for kids of Oklahoma City Local 850. Across the Southern Territory, a total of over $39,500 was donated for the families still recovering from their 112-day strike at Tinker Air Force Base. Cincinnati Local 912 held several unique fundraising events to benefit Guide Dogs of America, the Wounded Warrior Project, and the Yellow Ribbon Support Center (YRSC). In the fall the annual Hooks & Hawgs joint fishing tournament and motorcycle run was held to benefit the YRSC. 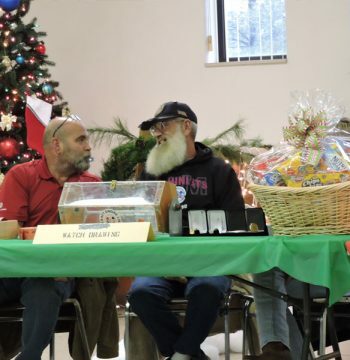 In October the 18th Annual Golf Tourney was held to benefit Guide Dogs of America, and just this week the local held their annual Holidays For Heroes benefiting the families of deployed soldiers this Christmas. In all, Local 912 raised more than $10,000 for their efforts, and many more in donations, but they weren’t done giving yet. The membership dug a little deeper, and contributed nearly $4,000 to the Shriners Burn Institute. If you and your members are giving back this holiday season and would like your photos posted, please email Communications Specialist Jonathan Battaglia at jbattaglia@iamaw.org. 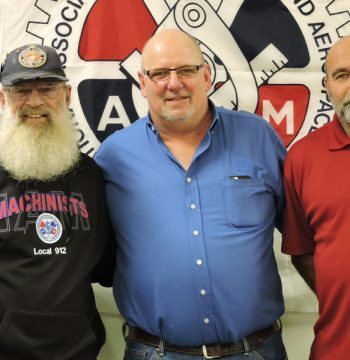 The post Machinists Show Giving Spirit this Holiday Season appeared first on IAMAW.